What can one say about a chapter informing us that “morality isn’t made of molecules,” and that attempts to stump nonbelievers by asking such questions as: "What does justice weigh? ", "What is the chemical composition of courage? ", and (my personal favorite) "Did Hitler just have ‘bad’ molecules”? It’s hard to know where to start. 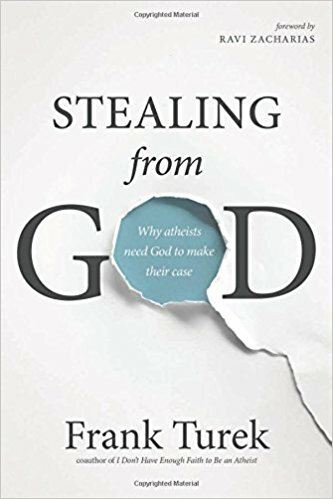 But I’ll begin by addressing the underlying argument Turek uses tying morality to God. Unsurprisingly, Turek maintains that in a godless universe, there can be no objective moral principles. Now, I happen to agree with that — but then I also think that there cannot be objective morality in a universe with a god. God’s got nothing to do with it. Turek is — again unsurprisingly — also a proponent of the modified divine command theory. This is the new and supposedly improved version introduced as a way to avoid a problem with the older theory. Only it doesn’t. In the original version, something is good because it conforms to God’s desires. So kindness is good because God desires us to be kind. But that means that if God desired the exact opposite, the exact opposite would be good. If he desired us to kill one another, murder would be right. And a divine command theorist cannot escape this by claiming that God only desires what is good (and thus would never desire murder), for that implies that there is a standard of goodness that is independent of God. In the modified version, something is good because it conforms to God’s nature. So love and justice are good because God is loving and just. But now the exact same problem arises: If God were hateful, hate would be good. And once again, a divine command theorist cannot escape this by claiming that God’s nature is good (and thus could not be hateful), for that implies that there is a standard of goodness that is independent of God. Proponents of the view might object that God is necessarily the way he is — so that it is impossible for him to have had a different nature — but that misses the point. (And if that objection worked here, it would work for the original version as well: One could as easily maintain that God couldn’t have desired anything other than what he does desire. So why invent a new theory to avoid that problem?) The reason this misses the point is that it fails to address the underlying question: What makes something good? Is it because it conforms to God’s nature irrespective of what that nature is, or is it because it conforms to God’s good nature? If the former, then the original problem remains. If the latter, then goodness doesn’t depend on God. For in that case, there must be something that makes God’s nature good other that it simply being God’s nature. We can also understand the problem this way: In order to find out what is good on the modified divine command theory, we must first find out what God’s nature is, and then adjust our behavior accordingly. Now, we may think that we already know what that nature is. But if tomorrow we discover that, actually, God is by nature a liar, not only would we have to regard truth-telling as evil, we would also have to now do the opposite of everything he commands. After all, that stuff about him wanting us to love our neighbor would have been just another one of his deceptions.